Allan Fulton, UC Irrigation Advisor, Tehama, Shasta, Glenn & Colusa Counties; Luke Milliron, UC Orchards Advisor, Butte, Tehama & Glenn Counties; and Richard Buchner, UC Farm Advisor Emeritus, Tehama County. Visual cues of crop stress are among the most basic observations that can be used to manage irrigation in orchard crops. However, these cues can be somewhat subjective and are often expressed after plant stress is higher than desired. Measuring midday stem water potential (SWP) using a pressure chamber is a quantitative method for evaluating plant water status. Relationships have been established between pressure chamber SWP measurements and tree growth and productivity. From these relationships, guidelines have been developed to assist growers in making irrigation scheduling decisions. During plant transpiration, water moves from the soil into fine root tips, up through the vascular system, and out into the atmosphere (Fig. 1). Water flows through the tree from high potential in the soil (about –0.1 bars of tension) to low potential in the atmosphere (less than –40 bars). Low potential is created at the leaf surface through small openings called stomata that open and close to regulate photosynthesis, gas exchange, and plant water loss. Simultaneously, water held in the soil enters root tissue and begins its journey to the leaves. This creates a continuous column, like a taut rope under tension within the water-conducting system of the tree. The amount of tension depends on the balance between available soil moisture and the rate at which water is transpired from leaves. Figure 1. 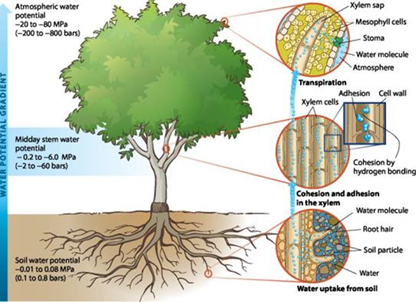 Illustration of how water moves from the soil through the tree and into the atmosphere, from both a whole-tree and cellular perspective. SWP measures the water potential gradient that drives this movement of water through the tree. Source: Adapted from Pearson 2008. Upper Saddle River, NJ: Pearson Education Inc. This is the most scientifically valid theory of how water moves through vascular plants such as orchard crops. It is a theory that has withstood the test of time over many decades and across a broad range of plant species. The scientifically-grounded concept of plant water potential, which enables you to directly and precisely measure plant water status with midday SWP, is the single biggest reason to consider using the pressure chamber. Midday SWP allows you to directly measure the water stress of the most valuable asset in your orchard- the actual trees! When adequate research has been conducted for a specific orchard crop to evaluate critical management thresholds and how they affect tree health, growth, and productivity, measuring SWP is like “asking the tree” to give you an indicator of its water needs. The living tree integrates and adapts to the soil-water and weather conditions, which we can then quantify with SWP. SWP provides a gateway to evaluate how satisfactory of a growing environment we are providing with our water management. If we use SWP measurements, we don’t have to make educated guesses about how deep the effective root zone is, and where we believe the tree is acquiring its water. SWP measurements can give us insights into how reliant an orchard is on irrigation as it sole water supply. In the northern Sacramento Valley, it’s quite possible for SWP measurements to reveal that deep soil moisture storage, spring rainfall while the crop is growing, and water table influences can be significant sources of water for deeper rooted perennial tree crops. If we use SWP, we gain more insight into how it might be integrating and adapting to non-uniform irrigation water distribution. The non-uniform water application may be related to sprinkler systems that have variability in the aerial distribution of sprayed water or variable soils that re-distribute water from drip emitters differently from one area of the orchard to another. SWP may also allow you to detect the effect of non-uniform water distribution from irrigation systems with poor uniformity resulting from design or maintenance problems. Managing water in orchards without SWP, could promote diseases that shorten their life span as well as miss opportunities to optimize costs of water and energy. Instead, by using SWP readings you can elevate your irrigation management precision and quantify crop water stress for carrying out specific crop management strategies. In almond production, SWP can allow you to impose mild to moderate crop water stress during hull split to lessen hull rot and achieve an earlier and more uniform maturation for an earlier harvest that reduces navel orange worm infestation. In prune production, SWP helps you to impose moderate crop water stress about two weeks before harvest to promote sugar accumulation in the fruit and reduce drying costs at the fruit dehydrator. In walnut, delaying spring irrigation until mild SWP water stress levels are achieved, can lessen the risk of root diseases and promote the development of healthier root systems. When a person is considering the pressure chamber for the first time, often the first impression is that it is too expensive and too labor intensive. Growers and consultants who already use the pressure chamber and SWP as one of their management tools indicate the cost to integrate it into their management ranges from about $10 to $20 per acre annually. This is a relatively low cost compared to the cost of water, energy, and other production practices. This accounts for the labor to take the measurements, compressed gas (nitrogen or carbon dioxide), time to evaluate the data, and maintenance of the instrument. It does not reflect the cost of purchasing the pressure chamber. Pressure chambers are generally much less expensive than other farm equipment and durable if handled and maintained reasonably. It’s not uncommon for a pressure chamber to last decades, so the cost of the instrument is generally nominal when amortized over several years and many acres. The cost of a pressure chamber can easily be recovered by producing an additional 1 to 3 tons of almonds, walnuts, or prunes over the life of the orchard. Read the second article in this stem water potential series here. Note: This is an abbreviated introductory discussion based upon the free, peer-reviewed UC ANR Publication 8503, Using the Pressure Chamber for Irrigation Management in Walnut, Almond, and Prune (2014).